Yes, I said it. I have started using paper plates during the week for breakfast and lunch. Like the really cheap, thin paper plates. Why might you ask? For one, our new house does NOT have a dishwasher. Built in 1970 and remodeled in 2010, our oh so beautiful house with the giant backyard that we completely fell in love with never had a dishwasher installed. So this SAHM has to wash dishes. By hand. Like 4 or more times a day. For the sake of my hands and my sanity, paper plates for 2 meals a day at $3 for an 100 pack it is. And I'm not ashamed one bit. Again, no shame. I tend to keep our house fairly clean (at least "clean" for having a toddler and preschooler running around all day). So when Tiny Human #2 drops his graham cracker on the floor, I don't cringe or stop him when he picks it up and eats it. We don't waste around here and a cracker on the living room floor for 2.5 seconds is totally edible. A little germs are good for their immune systems and we're rarely sick around here. So when my preschooler "accidentally" drops the piece of broccoli he has to eat before he can get up from the table at dinnertime, by all means he is going to pick it up off the floor and eat it. You read that right. I just can't bathe my children every single day. When I only had one, he got a bath every night as part of his bedtime routine. Then #2 came along. And mommy was more tired. And Tiny Human #2 has incredibly sensitive skin. So bathing every night wasn't an option. We still do baths every 2-3 days depending on the season and how dirty we do get, but I'm sorry it just can't happen every single day of life. I'm in the camp that my kids do not need me to maneuver their every waking moment every day. I encourage them to play independently for a little while everyday, whether alone or together. Their imaginations are much more amplified when mommy isn't right there. Their little brains are so good at coming up with stories and scenarios if I'm not hovering. They need time to develop their play styles and mom orchestrating the event doesn't help them at all. I do play and read with them a lot through the day, but they really enjoy playing together with or without me. When Tiny Human #1 stopped napping, my world imploded. Naptime was always the 2-3 hours that mommy got some alone time, did chores, worked on projects, and in some very rare instances read a book or took a quiet shower. So now that Tiny Human #2 takes 1 afternoon nap for 2-3 hours (that has recently dropped to an hour!! ), Tiny Human #1 has to play quietly in the playroom or his room for 30 minutes- 1 hour. He can play, read books, lay down, do his "work" (writing practice), or once a week on Friday, pick a movie to watch. This gives all of us a break from each other. Because, let's face it. As a SAHM, the 3 of us spend every waking moment together and even my 19 month old will sometimes tell me "Mama, gogo. Play". Which I have gathered that in his terms means "Mommy, leave me alone for a little bit so I can play by myself." I love my little family to pieces. We all "mom" differently, but why do we mom the way we do? Because we love those tiny little humans fiercely and are doing our best with them. In an Instagram world, it's hard sometimes not to think that you could be doing better. But guess what? Some days are about survival. When I had a toddler and a colicky newborn while battling Postpartum Anxiety, there were days when no one got out of their pj's and we watched tv all day. There have also been days when everyone is fed, dressed, teeth brushed, and out the door for a day of activities by 8 am and I feel like supermom. 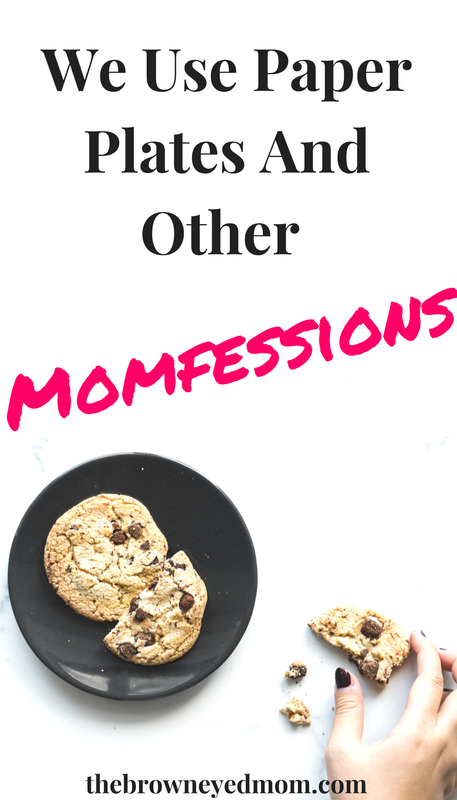 So do you mama... All parenting styles are different and we do what we think is best for our kiddos. Don't strive to be a picture perfect Instagram mom. Strive to be the best mom your kids need you to be, even if that means using paper plates for meals so you don't go crazy washing dishes all day long!